Hi folks! It's been a busy weekend here in KC-land! We're still running on turkey, dressing and mashed potato re-runs. It was a particularly good cooking year for me, so I'm not bored with it all just yet... I tried a few new recipes and most will become "keepers". Plus, I haven't had to cook since Thursday - yay! The challenge is to remember next year *where* the recipes are. Since I cooked off the iPad sucessfully (rather than print out the recipes), I now need a good iPad app to bring everything together along with my notes and changes. I'd love to add all the other recipes I use so I can ditch the recipe box, recipe pile and recipe notebooks as well as the magazines that I keep for one or two goodies. Does such an app exist for the computer/iPad? What do you use to keep your recipes straight? I've also been restocking one of the shops with Christmas pins. 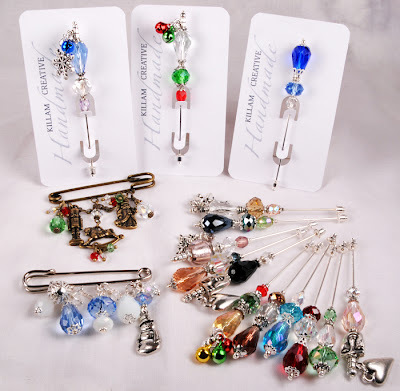 I had a lot of fun with the kilt pins - the charms are gorgeously detailed TierraCast findings that are fully formed on front and back. The jingle stick pins tickle my fancy and make a tiny little tinkling sound when the wearer moves. Really, it doesn't take much to make me smile! Etsy home page, where you can Browse different sections. You'll need to click on a section to the left - like Women or Men or Kids or even the fabulous Vintage or Supplies. Oh how I love to browse those sections! Know what you want? Use a Categories search instead of Browse. 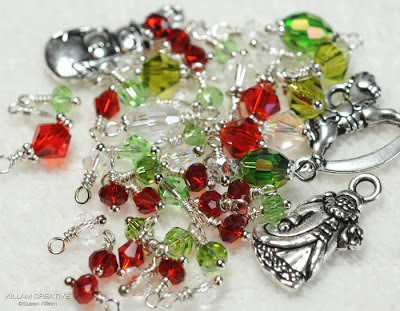 It can be a lot faster if you don't want to get distracted by all the pretties *wink*. Coupon Codes again, and this is really important: Don't forget to use it at check out! Look at your shopping cart (full of goodies!) and on the left under "How You'll Pay" is a blue link called "Apply shop coupon code". Click it! Yes, I've forgotten once or twice in the past... If you are buying from more than one shop you'll need to check out separately, but Etsy handles that for you. Just don't forget those coupon codes! Have a question about Etsy? Shoot me an email and I'll gladly help! Ok, gotta run. We pulled all the Christmas from the attic and now I need to do something with it. :) Thanks for visiting today! Hiya friends! I am working on Christmas-themed kilt pin/brooches these days as well as new stick pins. I always have a Thanksgiving sale in the shops and guess what? I think I've had my head in the sand because it was a bit of a shock to me that Thanksgiving is next week. Gah! Lots to do... lots to do. 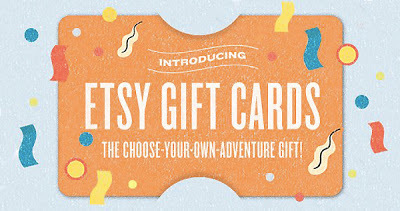 Oh, and have you heard that Etsy now accepts gift cards? You buy directly from Etsy and can use it at any shop that accepts gift cards! Click the photo for all the details. Hey, you know, I'll have to put one of these babies on *my* wish list this year!